I grew up in Utah, but my heart belongs to Washington State. I am the second in a family of four daughters. I was born 13 short months after my older sister – I was a bit of an oops! – which was great for my sister and I growing up, but now that I have kids of my own, I constantly wonder how my mom did it (plus earn a masters in Speech Pathology). I have a bachelors degree in English Literature with a minor in art. 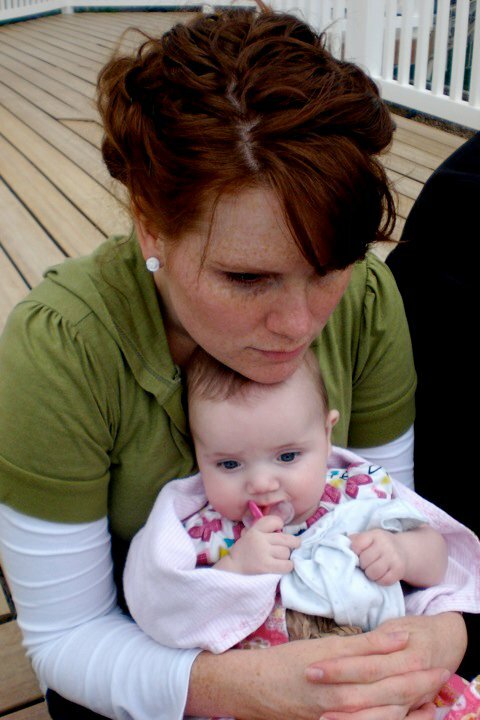 I’ve had a few careers that I’ve loved (mainly in office management) – but am now a Stay At Home Mom. My family has made great sacrifices to bring me home, and I’m grateful for it every day. Even when I’m divinely covered in diapers. 1. What’s your favorite part of motherhood? I love that these two (almost three!) amazing little people belong to me. Knowing that Father in Heaven trusted me with these incredible individuals is humbling and exhilarating all at once. There are so many moments when I feel such motherly pride in my kids – and so many moments when I am blown away by how much better they are than I am. 2. What part of motherhood would you subcontract out if you could? Right now, I would subcontract the bedtime routine. My 3 year old is going through a phase where he gets out of bed every 20 minutes ALL NIGHT LONG. Husband and I are exhausted, thinking: our newborn will not be *this* tiring! Ah, to have a full night’s sleep! 3. Name 2 or 3 items on your “bucket list.” (Some things you’d like to do before you die.) I’d love to write a really great YA novel and have it published. I’d love to see Europe. Pretty much ANY part of Europe. I want to run a marathon without dying. 4. Brag for a minute. Do it. What are a few things that you’re pretty good at? I’m good at hostessing parties. I love the details of it – and if I can hostess a party *for* someone else? Like a baby shower or birthday party? I’m in my happy place. I’m also pretty darn good at drawing hands and feet. I earned that one through lots of practice. 5. What are you loving lately? My husband. He has really stepped up and helped me with these last few preparations for our little man to arrive, and he is so patient with our two kids, and he is always so willing to give me a foot rub. I just keep thinking, man. You don’t have to do all this. But he does it willingly and lovingly – and I have a hard time not falling at his feet, clinging to his pant legs, crying “I’m not worthy!” Also, lately, I’m loving Costco’s grapefruits. Huge. Juicy. Sweet. They’re kind of unreal. 6. Do you have a favorite scripture or quote? Why? One of my favorites is “Be Still, and know that I am God.” My mind and heart often go into overdrive with worry, concern, or just get overwhelmed – and I like this constant reminder that He’s got it all under control. What I need to do is not PANIC – but take the time to Be Still, and Know. 7. What do you gravitate toward during your unscheduled time? Reading and blogs (writing mine and reading others). Often times, I sit there looking between my book and my computer, playing attention-tug-of-war with which I’d like to do. Unless Bill has a rare evening free from work or homework, and then we’re watching Dr. Who or Pushing Daisies with a bowl of frozen yogurt. 8. Tell us some of your best mom-tricks (things you’ve figured out that work well for you). Make your chores a game for the kids. Wyatt LOVES to help me haul the laundry upstairs if we do it train style, and he’ll help me load it if we can both be cranes. This way, I can get done what I need to without little hearts feeling neglected. Because, otherwise, I’d never get ANYTHING done! The curse of overly cute kids. 9. What’s something you don’t usually want people to know about you, but that they need to know if they’re going to be your friend? I hate hate hate the cellphone. I don’t answer it. I usually don’t even have it on my person. The kids think it’s theirs because I let them chew on it/throw it against walls/call China with it. Right now, it’s sitting on the desk behind me, chirping that it’s almost out of batteries, and I think dagger thoughts at it that I don’t care. I hate talking on the phone. Even if you’re my best friend and have been for fifteen years – I still won’t answer your call. People take this personally. Then I remind them that twenty years ago, there weren’t cellphones. This doesn’t help, somehow. This is just one element of technology that has never agreed with me. 10. If you were in charge of a girls’ night out, what kind of activity would you love to plan? I’d want to do something elegant – like a nice meal out, because my women folk and I would appreciate the effort that goes into something like that – and I’d want to do something creative. So that we leave our girls’ night out feeling both pampered and uplifted. I’d also want to buy them all a really great handbag or something. Am I rich in this scenario? 11. Friends are great for venting. What’s been frustrating you lately? Picking up after other people. I know, great frustration to have when you’re a mom! What can I say – I’m in the ornery stages of pregnancy <grin>. Also, when someone dumps the food from their dish into the disposal side of the sink (good idea) but leaves it there instead of rinsing and running it down (bad idea). Especially if it involves bread which then gets soggy. Soggy bread is my kryptonite. I just can’t handle it. 12. What parts of your testimony are you the most sure of? Great question. The past year and a half, my testimony that God knows me individually and has an individual plan for me and my family has grown tenfold. That He works miracles in our everyday lives, and that He is willing to let us suffer – even though it pains Him – to answer our prayers to become better people. And – maybe most importantly – that His plan is waaaaaaay better (and cooler and more intricate and complete) than anything I can come up with. Tell us about your blog: I write over at Stepper Was Here. Simple as its name, my blog is basically a place for me to explore what it means to me to be Mormon, a Wife/Mother, and a human being. Thank you so much, Stepper. Hug that sweet little new baby of yours and bask in our admiration. my world got better when I met the two Stephanies. Congrats on the baby Stepper and thanks for sharing! Thanks, Lisa. I think it’s fixed now. Stepper, you sound really cool. Congrats on the baby…I’m assuming there will be a “baby story” on your blog…heading over there now! I am going to check out your blog now. I wish I lived 5 miles away from you guys!!! So nice to meet ya Stepper. By the way as soon as I saw the name Stepper I knew I was going to like you. How can you your nickname be Stepper and you not be cool? Can’t wait to check out your blog and become blogging BFF’s. 🙂 Congrats on your baby. Hooray for babies!!! What a dynamic personality comes through her writing! Honest and real.